Elevate their smile quotient with an Anniversary "arrangement" of festive Mylar balloons. 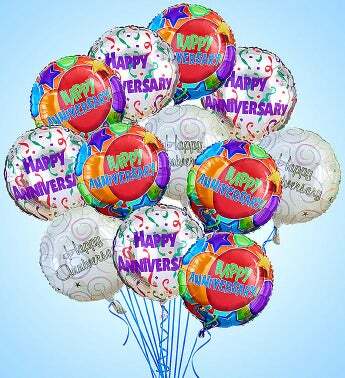 Choose from one dozen or a half-dozen "Happy Anniversary" balloons to send your spouse, soul mate, or that special Anniversary couple a lasting smile. Elevate their smile quotient with an Anniversary arrangement of festive Mylar balloons. Choose from one dozen or a half-dozen 'Happy Anniversary' balloons to send your spouse, soul mate, or that special Anniversary couple a lasting smile.